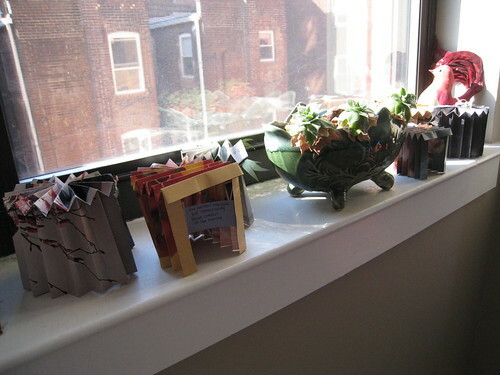 The first seven forts waiting in the window. Tonight I am taking a break from making a fort because I am woefully behind on blogging about them. I have technically started tonight’s fort, but I hope to make a few in the morning and then fold up another week’s supply. That is the key to not falling behind on their construction. I didn’t realize when I started this project that by adding the forts to my day, I would give up so many other things. I have packed away my embroidery for the Welcome piece. I have also given up on cleaning. Plus leaving the house. While that is not completely true, it feels like it. I did manage to do a major overhaul of our office area, which inspired one of the forts. Plus I ran some errands in Columbia Heights and made some yummy banana bread. And tonight I transported all fourteen of my forts to the studio for First Friday. So I did accomplish a few things this week even though it feels like a lot of other things are falling through the cracks. Plus I am well aware that I am not featuring Lucy on the blog as much as my family would like. I actually have started taking pictures of her each morning when I photograph my little fort. I am using my real camera and not the so-so pictures on my iPhone. I have a routine. I make the fort each night before we go to bed. Then I take a picture of it after breakfast, hence the reason Lucy is still in her pajamas. Then I upload the photos during nap time. In other creative news, Kim is making great progress in her 4 and 40 Blackbirds. Check out her latest poems!